The Challenge was the lifting of the Apollon’s Wheels – a 366 pound (169kg), 1.93 inch diameter bar that doesn’t rotate!! Ivanko Barbell Company made an exact replica of the original APOLLON’S WHEELS. This is followed by the Arnold Strongman Challenge – one of the most exciting strongman events we have ever seen, featuring the world’s strongest men!! See some of the biggest names in World Bodybuilding!! * ARNOLD SCHWARZENEGGER introducing a fashion show, including RONNIE COLEMAN as you have never seen him before!! The Challenge was the lifting of the Apollon’s Wheels – a 366 pound (169kg), 1.93 inch diameter bar that doesn’t rotate!! Ivanko Barbell Company made an exact replica of the original APOLLON’S WHEELS. Man Mountain MARK HENRY (see front cover) won this event and the Hummer by clean & jerking this ponderous beast of a weight 3 times!! It also equalled the world record. 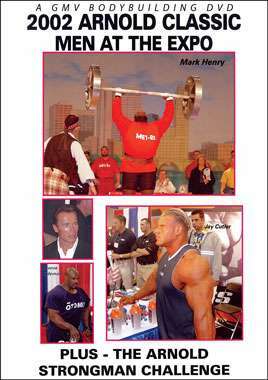 2002 Arnold Strength Summit – Final Results and total points.